Anja Dornieden is a filmmaker currently living and working in Berlin. She obtained a Fulbright Scholarship to study at The New School University from 2007 until 2010. During her time in New York she started making her own documentary and experimental films in Super8 and 16mm. Since 2010 she has been working with Juan David Gonzalez Monroy under the moniker OJOBOCA. Their work has been presented internationally in a variety of festivals, galleries and museums. 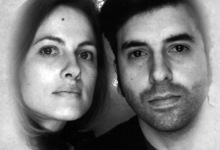 They are both members of the artist-run film lab LaborBerlin.